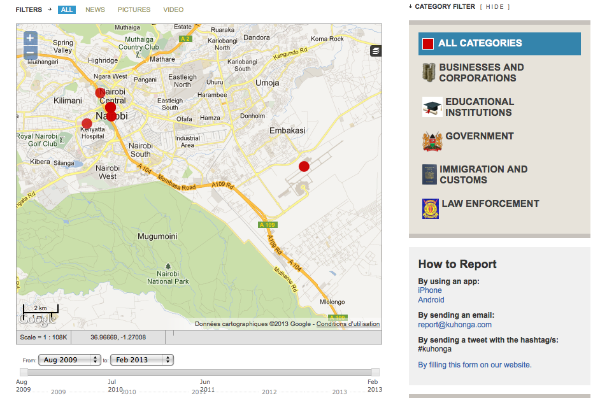 It was originally developed to map incidents of violence during the Kenyan elections in 2008. 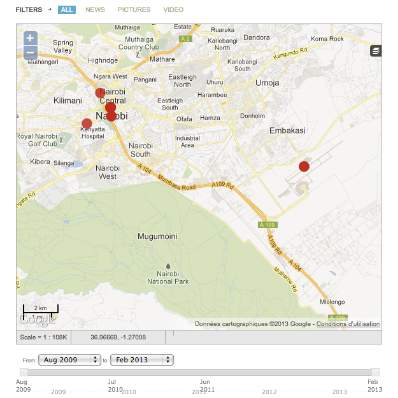 Now Ushahidi (meaning 'testimony' in Swahili), is widely used in many different scenarios, including emergency response management and citizen media. See a full list of deployments. Ushahidi has several alternative versions that differ slightly from each other. The standard version allows for more customisation, and means that you have full control over your data -- but it does require a server. SwiftRiver enables the filtering and verification of real-time data from channels such as SMS, Email, Twitter and RSS feeds. Crowdmap is the simplest tool to use: the developers claim it can be up and running in as little as two minutes. Crowdmap is a hosted version of Ushahidi that is cloud-based and usable through a web browser.